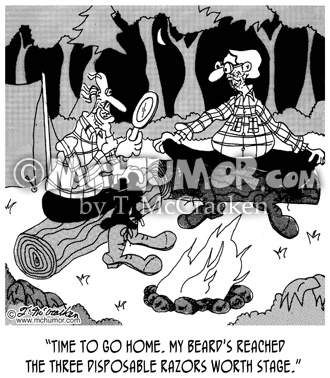 Camping Cartoon 5269: A man camping saying, "Time to go home. My beard's reached the three disposable razors worth stage." 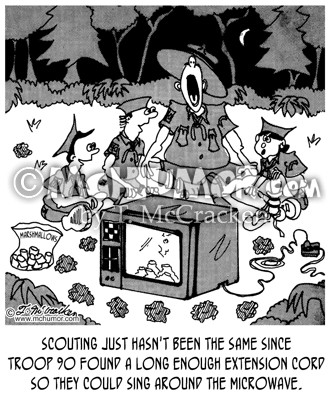 Camping Cartoon 5272: "Scouting just hasn't been the same since Troop 90 found a long enough extension cord so they could sing around the microwave." 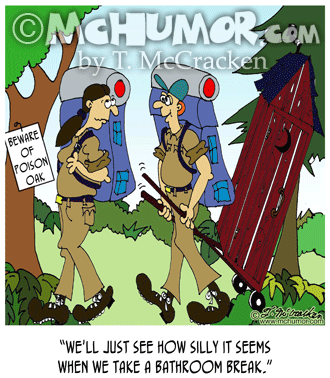 Hiking Cartoon 7421: A hiker pulling an outhouse on wheels passing a sign, "Beware of Poison Oak," says to the other: "We'll just see how silly it seems when we take a bathroom break." 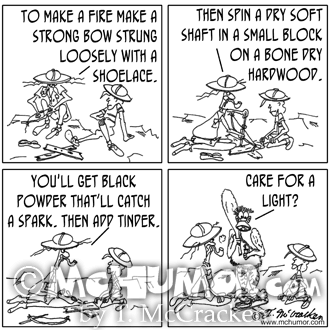 Anthropology Cartoon 5268: "Modern Foraging Techniques." 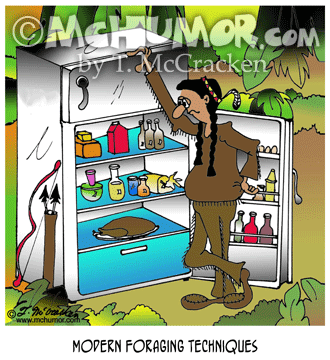 In the woods an Indian stands in front of a refrigerator trying to figure out what to snack on. 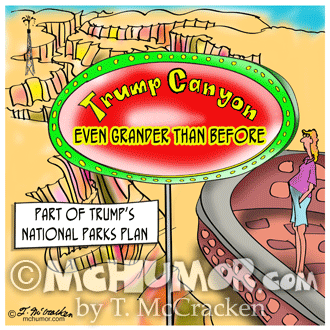 Grand Canyon Cartoon 9487: A glitzy sign over the Grand Canyon says “Trump Canyon, Even Grander Than Before.” “Trump’s National Parks Plan.” An oil well is in the distance. 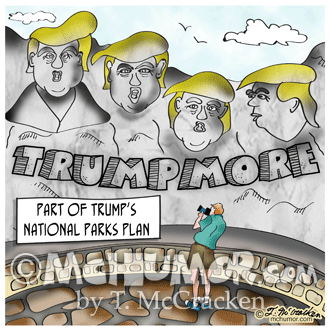 Trump Cartoon 9488: “Trumpmore” “National Parks Implement New Trump Policies.” All the heads on Mount Rushmore are of Trump. 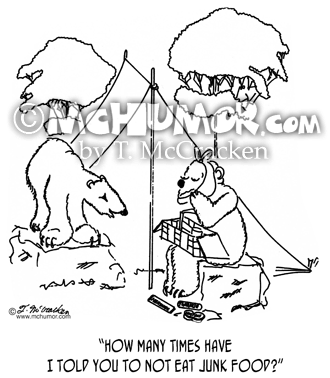 Bear Cartoon 0862: A bear says to another with a bandage around his jaw and is raiding a picnic basket, "How many times have I told you to not eat junk food?" a spark. Then add tinder. Then add tinder." 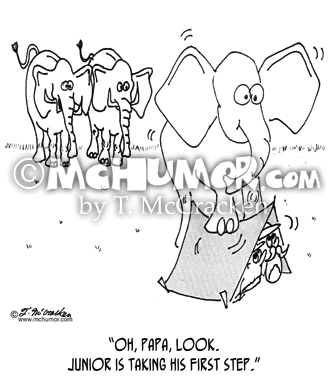 A caveman comes up and asks, "Care for a light?" 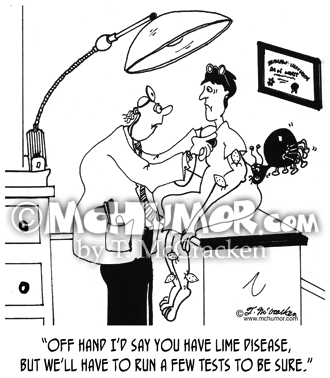 Doctor Cartoon 6037: A doctor says to woman with limes on her body and a humongous tick on her back, "Off hand I’d say you have lime disease, but we’ll have to run a few tests to be sure."